SET UP WILL START AT 7 AM! CONCESSION STAND WILL BE OPEN!! 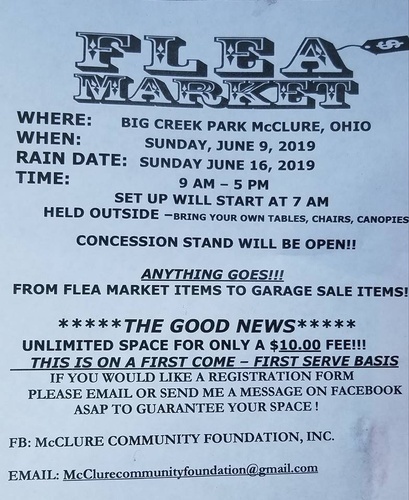 FROM FLEA MARKET ITEMS TO GARAGE SALE ITEMS!! THIS IS ON A FIRST COME – FIRST SERVE BASIS! PLEASE EMAIL OR MESSAGE ASAP TO GUARANTEE YOUR SPACE ! 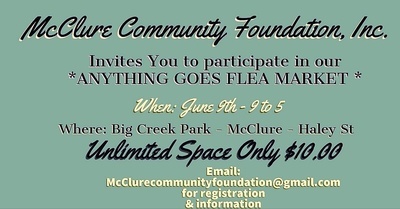 FB: McCLURE COMMUNITY FOUNDATION, INC.